The new expansion will be named Journey to Un'Goro! The expansion releases Early April. We will see more card reveals starting on March 17th. 135 New Cards will be added to the game. Each class will be receiving two legendaries; One quest spell and one minion. There will be five neutral legendaries in the set. There is a new tribe called Elemental. Some olders cards will gain this tribe. There are new Quest cards which are Legendary Spells. Quest spells are unable to be obtained through random effects like Babbling Book or Discover. A new keyword called Adapt has been added. A pre-order is available for $49.99 USD which gives you 50 packs and a special card back. Four new cards have been revealed! You can use them in our deckbuilder and view them in our card database. 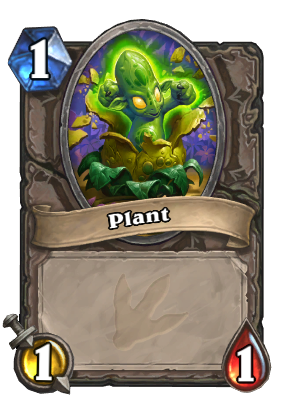 Blizzard has revealed several token cards, including a Plant that is a contender for Cutest Art of the Year. The new Adapt Mechanic works like Discover in that you get to choose from 3 random options. The total pool of options is 10 of which 6 were revealed with the announcement and the other 4 confirmed by Mike Donais on reddit. Liquid Membrane - Can't be targeted by spells or Hero Powers. Flaming Claws - "+3 Attack"
Living Spores - Deathrattle: Summon two 1/1 Plants. Unknown Card - Destroy any minion damaged by this minion. The pre-order card back returns! If you pre-order 50 packs for $49.99 USD, you get this awesome back. 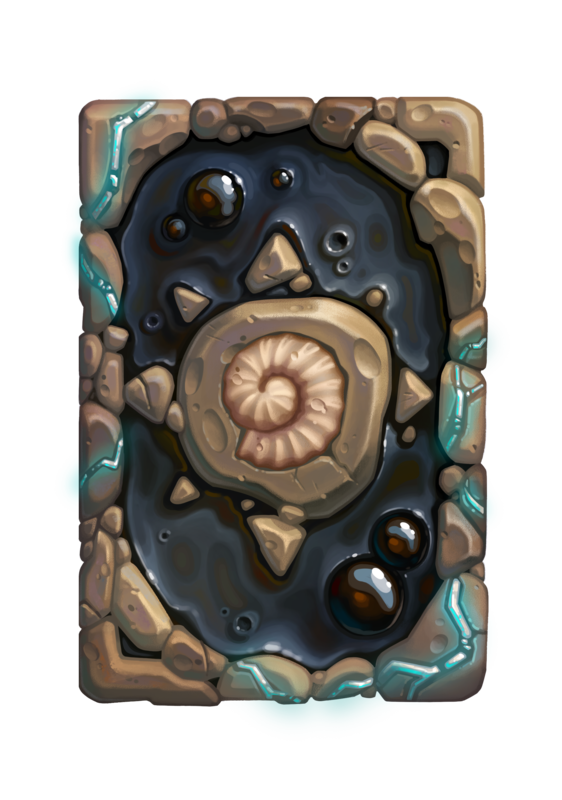 A card back was shown on the official Journey to Un'Goro website which has an unknown origin. We're assuming it's a seasonal card back for April. I assumed it was a keyword, sort of like a secret only with the condition (/option - I assume you can mulligan them away?) that they are added to your starting hand. The question I have is will N'Zoth summons count for the quest, I doubt it does since it doesn't for normal quests, but it does trigger some other in game mechanics (knife juggler I believe). Do we get a 'normal' legendary minion AND a quest card for each class? So 2 legendaries per class? What about neutral legendaries? Prior sets have had 10-12, do the quests cut into that number? 1-3 neutrals? OMG. Warlocks Dark Peddler can discover Quests? So again, this means quests are not spells or minions, but an entirely new card type? Ready to join Elise Starseeker and her junior explorers on an expedition into the uncharted territory of Un’Goro crater? Your descent into these wild lands will be a thrilling adventure—you’ll make wondrous discoveries as you become one of the first to unearth mysteries long forgotten under the thick jungle mists. Un’Goro’s prehistoric inhabitants may not take kindly to your curiosity, but you never know who might appear to offer assistance in your time of need. Pack your journal and a trusty quill, because there’s more to the inhabitants of Un’Goro than meets the eye—135 all-new minions, spells, and more await you in Hearthstone’s newest expansion. Nothing is more primal than the elements themselves, and Un’Goro’s ancient energies empower the resident elementals with a vigor and ferocity not seen anywhere else. Some of Hearthstone’s familiar faces will gain the Elemental minion type, joining the ranks of Murlocs, Dragons, Pirates, and Beasts for exciting new synergies. Quickly, grab your quill—we’ve stumbled upon one of Un’Goro’s resident fauna, the Verdant Longneck. While it may seem like a simple, harmless herbivore at first glance, these creatures have the ability to adapt to threats in their environment. Write this next part down! The new Adapt keyword allows a minion to become infused with elemental power, granting it new properties. Similar to the discover mechanic, you will be presented with three options when you play a card with Adapt. You can choose one of these three options to immediately buff your minion. There are ten total Adaptations to choose from, so you’ll have plenty of options to respond to threats presented by your opponent. While we’re in Un’Goro, let’s be sure to see and document all we can. From the hottest volcano to the stickiest, bubbliest tar pits, there’s a wealth of new and exciting things to discover. Let’s make it a personal Quest to see them all! Quest cards are an exciting new card type coming to Hearthstone. Quest cards are Legendary, so you can only have one in your deck, and they’ll always appear in your opening hand. Each Quest will have prerequisites listed on it—should you complete them, you’ll be granted incredible rewards! Quests show up on your Hero Portrait once you play them. 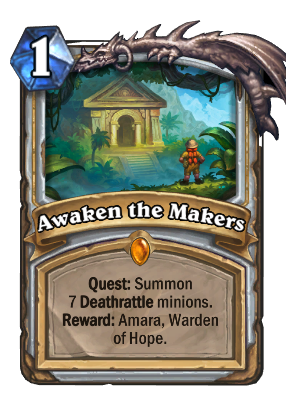 Check out the Priest Quest “Awaken the Makers” and the card awarded from completing it: Amara, Warden of Hope! Pull back the vines and peer through your spyglass at the delightfully overgrown Un'Goro game board! On a dangerous trek, it helps to be prepared for anything! 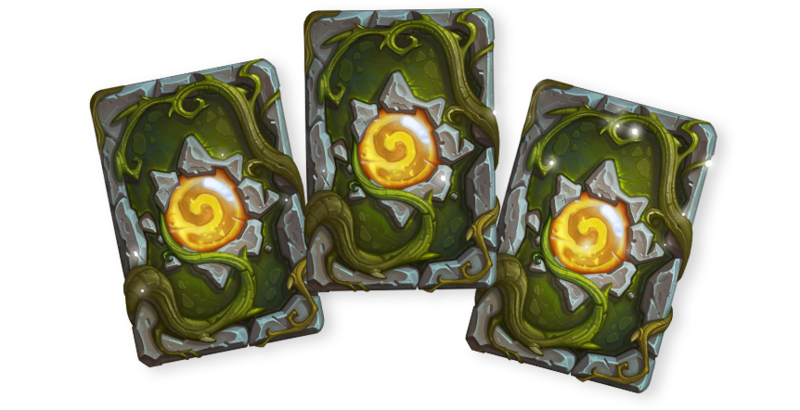 Starting tomorrow, you can pre-purchase 50 Journey to Un’Goro card packs for $49.99 USD and receive the Fossil card back. The extra supplies will be waiting for you at base camp. By Elise’s calculations, you should arrive there in early April, just in time for the expansion’s official release. Be sure to triple-check your supplies before heading out on your expedition.! Dinosaur repellant? Check. Tar-Be-Gone? Check. A Hearthstone-compatible device to play on (Windows, Mac, iOS, and Android) . . . check. It looks like you’re almost ready to head out! Elise Starseeker and her band of brave, pint-sized explorers will be cataloguing their findings on ungoro.com. Since you’ve been enlisted to join Elise for this expedition, you’ll be able to influence where the explorers go and what they search for, so be sure to check back regularly and provide your expert opinion along the way. If you see anything peculiar, be sure to document your findings with the hashtag #UnGoro. A true adventurer shares their findings with the world! Be on the lookout—we’ll be revealing Un’Goro’s secrets (and minions, and spells) over on the official Hearthstone Facebook and Twitter. We hope you’ve enjoyed this first look at Journey to Un’Goro. More card reveals will begin on March 17. Get ready to take a walk on the wild side—The Year of the Mammoth and Journey to Un’Goro officially launch in early April! Prepare for a New Year - Get Cheaper Packs! Although you can't make use of this offer for Un'Goro packs yet, you can collect cards on the cheap from expansions by using Amazon Coins. It does require an Android device though since you need to install the Amazon Underground Appstore in order to get the correct Hearthstone app that lets you redeem the coins. So go buy some Amazon Coins at a discount to get cheaper packs! 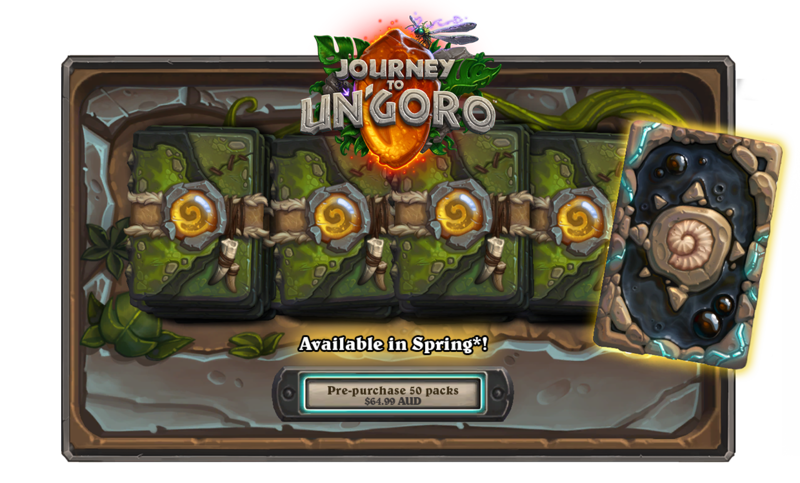 You can save your coins for the Un'Goro launch or spend them on older packs now. With The Grand Tournament rotating out soon, you can use this as an opportunity to get those packs to finish your collection one last time. Be sure to visit our guide to learn more about Amazon Coins. Ah blizz, making subtle mortal kombat references...maybe one of the neutral legendary cards from the new set will be called Sho'khan, Un'Goro Warmonger, or something similar, like a 4 armed warlock demon. So, Verdant Longneck is a terrible card. 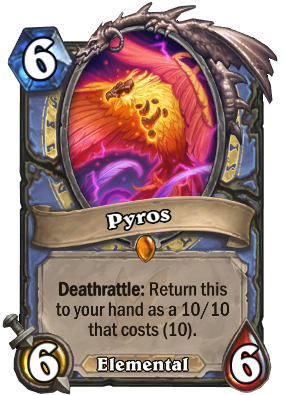 Out of the 10 options, 7 of them make this similar to a card that already exist and have seen no play at all. You want a minion with Poisonous to have high health, and 4 health is not a lot. With divinie shield is better than other minions with divine shield, but they were not really that good to begin with. And sticky minions are good, specially when they have more attack than health, which makes the deathrattle option is probably the best one. Only 2 out of the 10 options to adapt are okay, that means that there is a 53% chance of getting a really bad minion with it. Adapt may be interesting with brann on wild. But this card can be played in a situation that calls for a certain affect making it more viable and flexible. 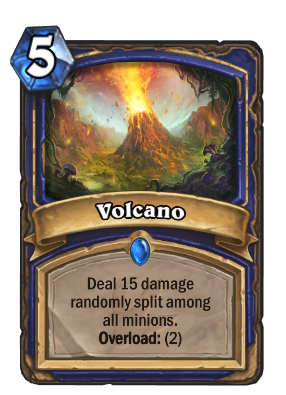 The cards similar to it aren't played because either they're badly statted or too situational, while I agree the card is lacking the initial stats it needs the adapt flexibility in my opinion can make this card playable. Interesting point though and good reasons to support your claim. I don't know why people downvoted this. 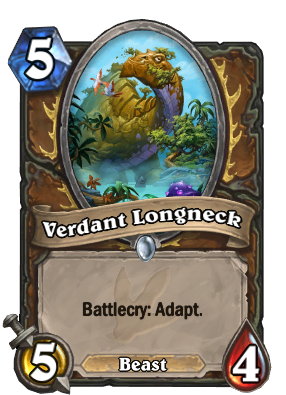 I'm all for the adapt mechanic, but verdant longneck is nowhere near viable as it is. 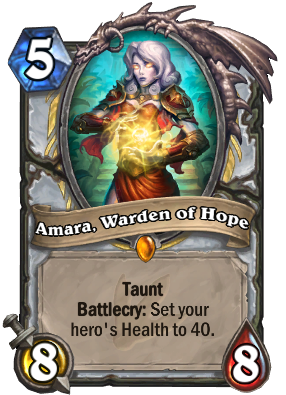 Could be the wrath of arena players who are probably quite happy with this card in the common slot. Constructed play isn't the focus of every player out there. This game is balanced around constructed (firelance portal being a common card, hello). But yes, it is an okay card in arena. 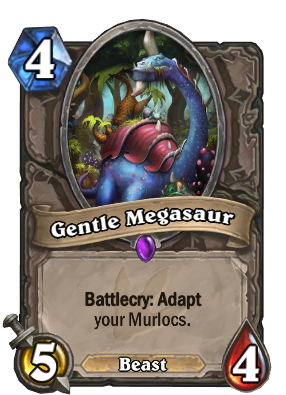 I suppose there will be a legendary which enables all 3 adapt choices. i hope it at least, because on its own it is weak. I hope you get other options with legendary minions, as well with 1 drops. do you guys know if that quest card is retroactive? Will count the deathrattle card that i played before? 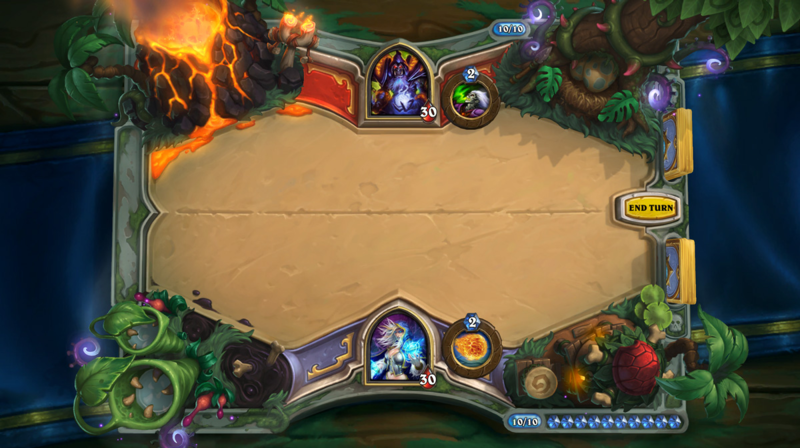 You get the quest card in your opening hand so you can play it instantly on turn 1 they said. 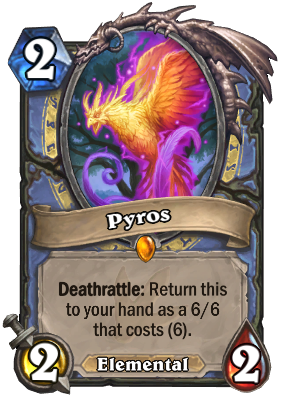 I doubt it would be retroactive, but I also wonder how often you won't be casting it on turn 1 (presuming of course all quest cards cost 1) in a deck that revolves around it and it's always in your opening hand. 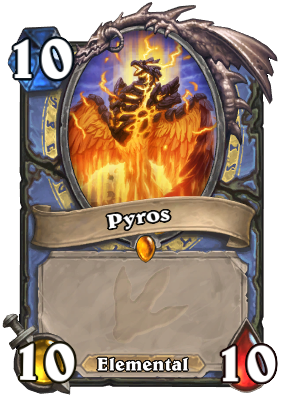 Pyros as a similar card to Jade Idol lol. I'm pretty sure that a 6 mana 6/6 is as good as a 1 mana 6/6 that sometimes draws you a card. I agree, they should remove the "shuffle 3 Copies"-Endless-option of Jade Idol and replace it with another option to make long games not completely useless. Instead of 3 copies of that card it could be 3 copies of a mana spell that only summons a jade golem, so at the most you could only have 6 more jade golems in your deck. Those nerfs are bad. You're just making cards that you hate useless.